This room looks absolutely amazing! The marriage of a neutral color palette and wood elements provides instant warmth, comfort and coziness in this space. Rustic elements such as the reclaimed wood walls, wood beams and wood shelves in this room conjures the look of a fresh, modern cabin in the country, don't you think? The beautiful antler chandelier helps to illuminate the lounging area while creates visual interest at the same time. By thoughtfully combining various patterns, textures and materials, this neutral space is transformed into a visually delightful and inviting retreat. I wish I can spend all day in this gorgeous room, what about you? Any thoughts? Adorable, Jessie! It's MY favorite room of the week too! So cozy. Love the scale of the bedside lamps, the lowering of the ceiling in sleeping/sitting spaces, the separate and comfortable tv/lounging area. 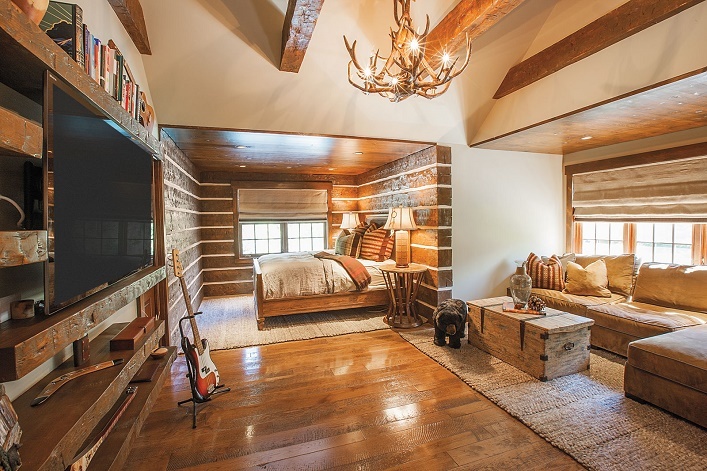 The structure of this room would be good for any kind of design with sheetrock/plaster walls as well as this rustic decor. Am saving this photo. Thanks for posting! Great for a weekend retreat.